"Corner’s direction never allowed a comedic moment to languish..."
It has been nearly twenty years since L’elisir d’amore graced the Vancouver Opera stage, so the return of Donizetti’s ever-popular 1832 Tristan-und-Isolde-meets-Much-Ado-About-Nothing confection in this colourfully kinetic staging was eagerly anticipated. 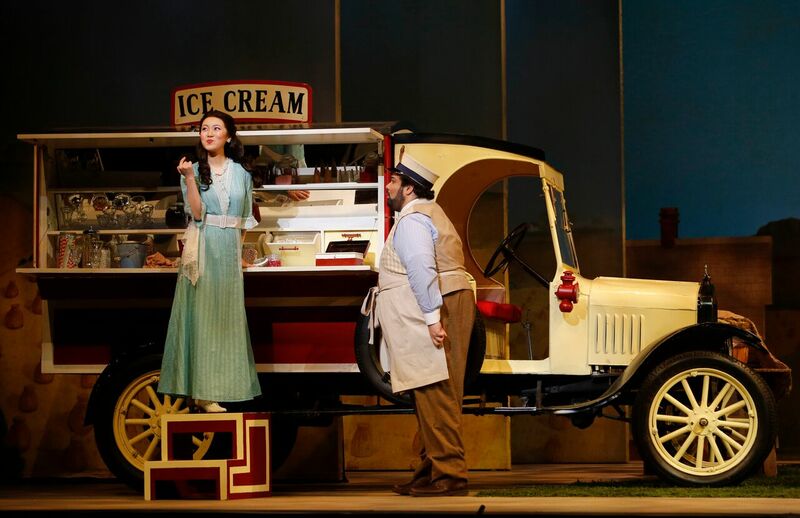 This production—originally by James Robinson but directed here by Brenna Corner—sets Elisir in Anytown, Canada in the decade before World War I. Adina is now the village librarian and Nemorino owns an ice cream truck. This eradicates the vast difference in their social standing—upon which much of the comedy of the original hangs—but at least the onstage visuals had a fresh look. On opening afternoon (2 p.m., Jan. 21st), the action percolated merrily away as I’m sure it was intended. In his VO debut, the plaintive edge to Andrew Haji’s versatile and flexible tenor made it ideal for the moping Nemorino must endure in his quest to win the aloof Adina’s heart. Although relatively new to the role (this is only his fourth Nemorino), he inhabits it comfortably and tosses off its considerable technical challenges with apparent ease. Clearly, Nemorino is to be a key role in Haji’s operatic future. 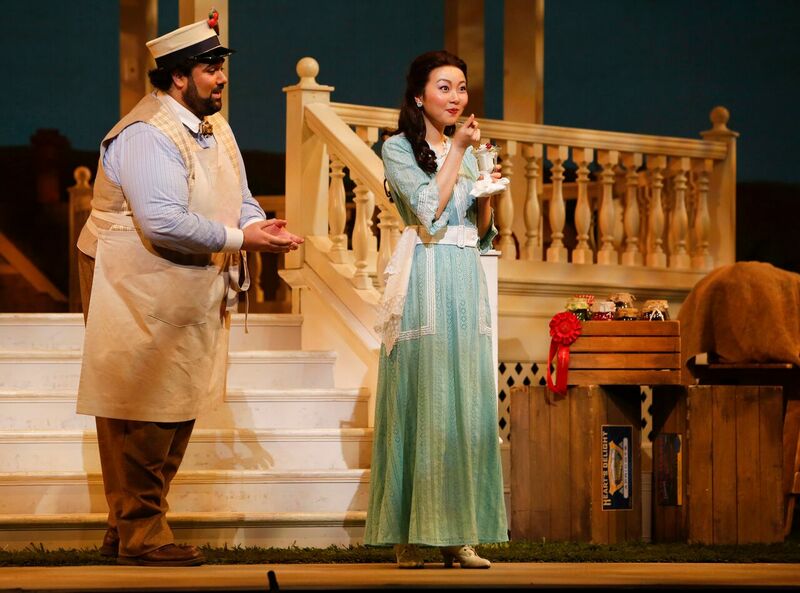 Adina was sung by Chinese soprano Ying Fang in her role and company debut. Her voice is silvery, light, sweet and agile and a natural stage presence and persona make her an ideal Adina. As with Haji as Nemorino, I see many Adinas in Fang’s career. Belcore, now a British World War I army sergeant, was sung with great aplomb by baritone Brett Polegato. As Belcore should be, Polegato played him as being completely smitten with his own allure to women—or at least as much appeal as a workaday British sergeant on a recruiting mission in Smalltown, Canada is likely to have. He added nuance to what can be a caricature of a role, though, and displayed effortless vocal agility when the music required it. 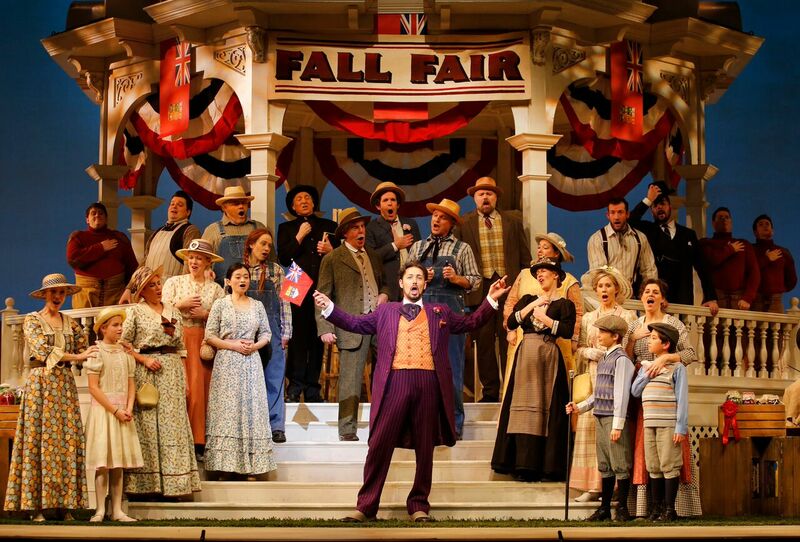 Bass-baritone Stephen Hegedus as the lovable old shyster, Dr. Dulcamara, came closest to fully realizing his role. All the requisite bravado, bluster and braggadocio were there, along with sure and fluid vocal command. And yet … the seemingly irredeemable huckster turns out to have some ethics after all and Hegedus made the turnaround smooth and quite believable. 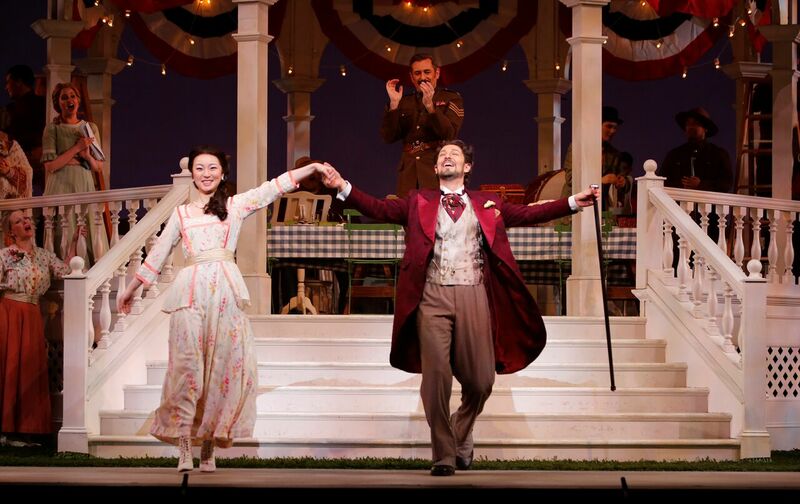 The rural Canadian town costumes of Martin Pakledinaz and Amanda Seymour (revival costume designer) were spot on and Allen Moyer’s straightforward, effective set made an unobtrusive backdrop to the stage shenanigans. Corner’s direction never allowed a comedic moment to languish, yet allotted ample space for Haji to maximize his famous “Una furtiva lagrima”—an aria that should never be hurried—for which the audience had been waiting over two hours. It was good to have Jonathan Darlington back in the pit, garnering a sparkling and remarkably precise performance from the spirited Vancouver Opera Orchestra. In equally fine fettle was the Vancouver Opera Chorus, upholding their high standards under Leslie Dala’s direction. Ultimately, this particular period update fell a bit wide of the mark: there is little humour to be mined from the pending horrors of World War I no matter how eager most recruits were to enlist. And most Canadian enlistees did not return home in 1918. Regardless, this was an undeniably well sung and executed Elisir from a largely Canadian cast with a nice mix of newcomers alongside seasoned veterans.